Many people think a Shortie with short arms and legs is a summer suit and a suit with long arms and legs isn't ! However it all depends on water temperature. In the UK, as a guide, a Shorty suit is for short periods in the water on warmer summer days. they are ideally suited to taking off and putting back on several times a day, perfect for younger children. Shorties are nearly always 3/2mm and if any thinner virtually useless in the UK. Summer suits in the UK are 3/2mm usually long legged and sleeves but sometimes have short or detachable sleeves. If you go for the short sleeve option then you will be colder on cooler less sunny days even with the detachable sleeves on whist in the water. Summer suits have either Flatlocked or sealed seams. Sealed seam suits are usually glued & blind stitched ( sometimes called cup stitching). The more expensive better quality suits can also be liquid taped for added strength and longevity. Flatlocked seams are very strong but will let water through. A Steamer is a suit with sealed seams, usually achieved by cup or blind stitching. This stops the majority of cold water from entering the suit once your body has initially heated it up. 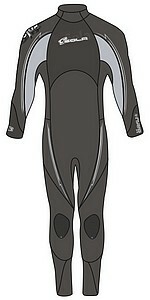 Winter wetsuits are steamers with a 5mm body and legs for warmth and 3mm arms for maneuverability. These are usually described as 5mm or 5/3mm or 5/4/3mm. Use a mild solution of Miltons or a specific wetsuit shampoo or hair conditioner to remove excessive smells. But only occasionally. Mesh or single lined or smoothskin is the term for neoprene without the usual external nylon lining. Mesh has a fine "mesh" pattern embossed into it for strength, smoothskin is as it sounds. It is warmer in strong winds. Mesh is often only used in carefully chosen areas of the suit as it is easy to damage with sharp objects. Also known as S or Super Seal. A type of rubber applied to the inside or outside seams in liquid form to achieve a 100% watertight seal and add to the overall strength of the seam. Liquid Taping can 'snap' as the suit is stretched whilst dressing so narrow neoprene tape is being used by some manufactures instead If you're paying £150 or more for a suit that doesn't have any taped seams, you're being ripped off! Firewall is a light, warm and very comfortable thermal lining, knitted with Tetron Polyester Hollow yarn which contains large volumes of inert air. This air is key to it's high insulating property. Firewall has a low water absorption, wicks moisture away from the body and is quick drying plus it has excellent 4-way stretch. Bamboo is the latest eco friendly thermal lining material. Blind or cup stitching is stitching that does not go through the suit to the other side and so does not let water through. This is what makes a steamer warmer than a summer suit as well as the thicker neoprene. It also makes it more expensive as the seams are glued by hand before the stitching. If the suit is then liquid taped you get extra strength and water tightness on the seams, well worth the extra cash. This stops any water from entering the suit through the zip and means the water has to come up and over the collar to enter the suit. So it keeps you much warmer in the winter months. A high quality shorty wetsuit with stretchy sleeves at a great price. A full length 3/2mm summer suit with super stretch sleeve and shoulders and 100% sealed seams. A very comfortable and warm summer suit. A full length 3mm summer suit with. A very comfortable and warm summer suit. 5/4/3mm double lined, blind stitched. hard wearing. Super Stretch liquid taped seams, Thermal lining Excellent value. 100% Super stretch neoprene. Batwing zip flap and integral collar i.e. no water through the zip! Firewall thermal system on chest and back. 5/4/3mm front zip steamer. Super stretch everywhere 100% liquid taped seams. Thermal lining. 6/5/4mm front zip steamer. 6mm torso panel, 5mm body, 4mm legs. Super stretch everywhere, 95% liquid taped seams 75% Quick dry thermal panels.